Last week, I took a train with five other girls down to Annecy, a cozy town nestled in the south of France. It sits 22 kilometers south of Geneva, at the northern tip of Lake Annecy. 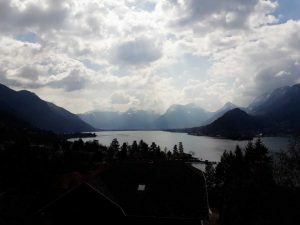 The area is known to be one of the oldest inhabited sites in the Northern Alps. Recent digs dated a lakeside village to 3,100 years before Christ. Despite its age, the town managed to preserve the purity of nature and survive through centuries of change. Its qualities even earned it the nickname, the “Pearl of the French Alps” in Raoul Blanchard’s monograph and the place is sometimes referred to as “The Venice of the Alps”. In 2015, Annecy was awarded the “Golden Flower” for being one of the nine most-flowered French cities. I can now say from experience that the beauty of the town certainly does not disappoint. I went to Annecy expecting to explore The Chateau de Montrottier or stroll through the waterside medieval town. 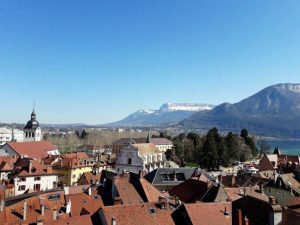 After a short weekend however, I found that the small town of Annecy offered more than a checklist of tourist attractions and breathtaking scenery. The athletic scene in Annecy, comprised of locals and visitors, was a culture that held its own place. 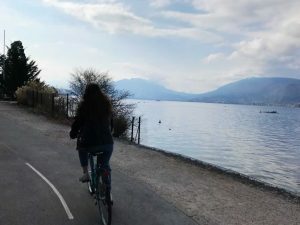 On the third day of our trip, we set out on rented bicycles to make our way around the lake that symbolized Annecy, the Thiou. The path around the lake was a formal industrial route turned tourist attraction. The store owner of the bike shop promised that the road was mostly flat with only one major hill. Like the naive tourists we were, we believed her. Fresh-faced with meager bottles of water and baguette sandwich in each basket, we headed towards the water. Right outside the town, pressed against the lake, is Jardins de l’Europe. It is enclosed by a wall over four meters high, and is connected to the city by a covered walkway with a drawbridge. Further down, only separated from the lake by a white gravel path, sits another expansive, more open area of grass. The mountains that enveloped the scenery stood like looming watchtowers protecting the crystalline lake below. Beside the waters, stretched canvases of cropped grass. The sun drew a healthy amount of expected meanderers who lounged there with their books, pets, or families. All these factors combined would have painted an ideal lazy afternoon, save the herds of people who took advantage of the air, space and weather in a different way. On a large patch of grass, a group of around twenty people practiced acroyoga. Weaving through the wandering tourists, tanned runners made their way down the dirt paths. A soccer team utilized another grassy area; their need for space didn’t interfere with the crowd at all. As we passed the park, the crowd was replaced a clean view of the lake. But even here, people were active. Paddle-boats and sailboats dotted the water. At this place in Annecy, tourists blended with locals; sports and activities took precedence over building attractions. The start of the bike ride around the lake was already on uphill. If the bike shop owner was correct, it would be the only one. But a countless wave of hills later, it became clear why the other cyclers were so prepared for the ride. After riding nearly halfway across the lake, we knew that moving forward would be easier than trying to re-tackle the hills behind, and resorted to going around the entire lake. Determination riddled accross our faces, we passed the Semnoz forest, a wild patch of nature that was little touched by man and breezed by the Finn plain. Because we were visiting during the winter months, crowds were low. Along the cycling paths, there were plenty of lake houses and large grassy areas to stop for picnics. In the Annecy countryside, speckles of farms mixed with quaint houses. When we rested to consume our baguettes, a parachuter from the direction of the pre-Alpine mountains of the Bornes and Bauges landed beside us. Even in the winter months of February, it seemed like all of Annecy was active. On the bike ride past the fields, we weaved through pockets of people and several camping grounds. But coasting by the water, we were completely wrapped in nature, a surreal escape from city reality. When we finally made it to the end, one of the girls smirked and whipped out her phone “congrats, we just rode 23 miles.” I nearly choked from surprise. Perhaps, for the athletic traveler, a 23 mile bike ride is no more than the usual workout. In that case, Annecy is an ideal vacation destination. 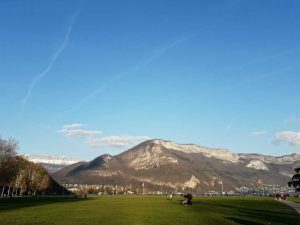 From sea and land to mountains and sky, Annecy offers not just an array of activities but crisp, clean air as well. In itself, the town of Annecy boasts of a beautiful river town and quaint buildings with rich histories. But behind the tourist attractions, the area is truly a haven for outdoor athletics.